a) Insert the water supply hose to the water valve connection pipe and fix it with nuts. 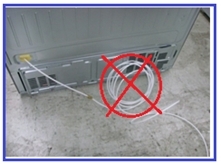 b) Check if there is any leakage at the connection areas and any bent part on the hose.When there is any water leakage ,do reassembly. 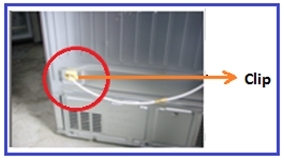 c) With a clip, fix the water supply hose to the refrigerator wall. d) Make sure that the water pipe hose is not bent ,or stepped on when making the water supply neat.